The thirteen episode format works quite well for The Originals. It tightened up pacing as well as upped the tension level which, in turn, created one of the best seasons of the show to date. At end of season three of The Originals, we saw the Mikaelson their entire world had been torn about. Klaus (Joseph Morgan; The Vampire Diaries) was now a prisoner, most of his siblings were in a mystical coma, and Hayley (Phoebe Tonkin; The Secret Circle) and her daughter, Hope (Summer Fontana; X-men: The Dark Phoenix), were left to fend for themselves. Fast forward five years and this is where Season Four starts up. Hope is now walking and talking, Marcel Gerard (Charles Michael Davis; Grey's Anatomy) is trying to keep to keep New Orleans at peace, and Haley is trying to to find a way, with the help of Freya Mikaelson (Riley Voelkel; The Newsroom), to bring her family back together. All the characters that survived the shocking ending of the third season are back — Klaus, Elijah (Daniel Gillies; Saving Hope) Hayley, Freya, Marcel, and Vincent (Yusuf Gatewood; Barbershop: The Next Cut), and appear in most episodes of the season. There are also some of the older characters of the show making a welcome return for some guest appearances including Rebekah (Claire Holt; 47 Meters Down), Davina Claire (Danielle Campbell; Prison Break), Cami O'Connell (Leah Pipes; Sorority Row), and Kol (Nathaniel Buzolic; Out of The Blue). A newcomer to the set, Summer Fontana does a great job as the young Hope Mikaelson and it is a shame that they will be time hopping once again thus requiring someone else to play an even older Hope in the upcoming season. It was also a sweet/bitter victory seeing Pipes return for a guest spot in this season, only further driving home the loss of having her character no longer as a regular on the show. Unlike in the past, Season four of The Originals is the first time the show went to a 13 episode format. This was caused by the fact the show was originally going to end after its fourth season and the network was given the show's creator, Julie Plec (The Vampire Diaries), the time she needed to wrap things up. This format actually worked quite well for the show. It tightened up pacing as well as upped the tension level which, in turn, created one of the best seasons of the show to date. The success of this new format and its fourth season, caught the attention of the network as well which has now greenlit a fifth season that will debut midseason 2018 on The CW in this shortened format. However, the final episode of the current season did offer closure for the show if, in fact, it had not been renewed. It should be interesting to see how the showrunners explain Season four's ending and get the show back on its feet. The DVD prevention of The Originals season four is in a 1.78:1 aspect ratio with a Dolby Digital 5.1 soundtrack. While the DVD itself is a lower resolution than its television release, it is still extremely decent quality. When it is displayed on a 4k screen the show upsamples quite nicely with minimum artifcating. Warner Bros. also offers an on-demand 1080p version of the season through the Warner Archive program if you are a videophile and want that extra resolution. The Originals season four DVD extras contain a look at the cast and crew at Comic Con, a Georgia infomercial (standard fare that seems to appear on all productions that are filmed in Georgia), Deleted Scenes, and a hilarious gag reel. Season four of The Originals is a mixed bag. The shortened season length helped quite a bit with the pacing of the show and while it offers its fan base resolution to a lot of the series loose ends, it also is a hard jumping point for people just getting into the show. Combining that with finality shown during the season's finale episode should make for an interesting for season five when it debuts on The CW in 2018. 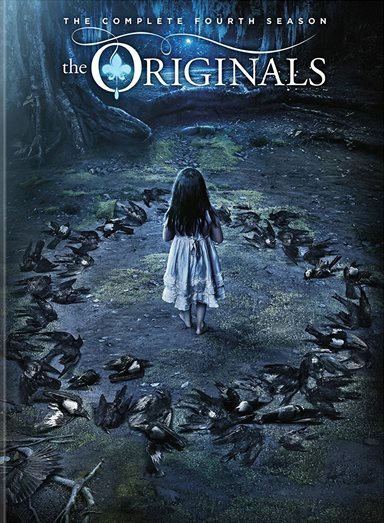 Download The Originals: The Complete Fourth Season from the iTunes Store in Digial HD.